archangels In the Pseudo-Dionysian hierarchy, the second highest rank of angels. The name “archangels” comes from the Greek term “archangelos,” meaning “chief messenger” or “eminent messenger.” Archangels, also known as “Holy Ones,” are liaisons between God and mortals; they are in charge of heaven’s armies in the battle against Hell; and they are the supervisors of the GUARDIAN Angels. They also serve as guardian angels to great people, such as heads of religions and states. They carry the divine decrees of God. Archangels also appear in Judeo-Christian magical texts. Joshua 5:13–15 describes a forerunner of the archangel in the form of a man whom Joshua sees in a vision, and who identiﬁes himself as “commander of the army of the Lord.” Daniel names two high-level angels, Michael and Gabriel, but he does not call them archangels. Angels who have a special place before God are often interpreted as archangels. Groups of four, six, and seven are mentioned in various texts. For example, REVELATION 8:2 speaks of “seven angels who stand before God;” EZEKIEL 9:2 describes seven punishing angels (six who wield swords and a seventh who carries a writing case); and TOBIT 12:15 has Raphael identifying himself as one of seven angels who transmit prayers of the holy, or who stand in the presence of the Lord. Among other angels described as archangels are Oriphiel, Zadkiel, Anael, Jehudiel, Sealtiel, and Barachiel. The Roman Catholic Church elevated the archangels Michael, Gabriel, and Raphael to sainthood. Michael is by far the most signiﬁcant of the three. He is the ruling prince of the order, who defends the church against the forces of darkness. 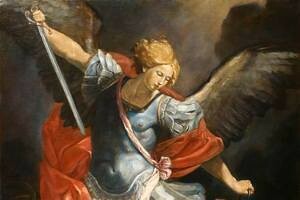 Michael is the only angel named in the Bible who is speciﬁcally called an archangel (Jude 1:9). In Daniel (10:13, 21), he is called “one of the chief princes” and “your prince,” but in Revelation 12:7 he is only an angel. Gabriel is often identiﬁed as the angel who visits Elizabeth and MARY to announce the forthcoming births of John the Baptist and Jesus, respectively. Raphael, identiﬁed as the prince of archangels, is a central ﬁgure in the book of Tobit, part of the Catholic canon but otherwise considered apocryphal. In Islam, the Koran acknowledges the existence of four archangels but names only two: Jibril (Gabriel), the angel of revelation, and Michael, the warrior angel. The other two are likely Azrael, the Angel OF DEATH and Israﬁl, the angel of MUSIC. See DEVOTIONAL CULTS; ENOCH. Charlesworth, James H., ed. The Old Testament Pseudepigrapha. Vols. 1 and 2 New York: Doubleday, 1983, 1985.
van der Toorn, Karl, Bob Becking, and Pieter W. van der Horst, eds. Dictionary of Deities and Demons in the Bible. 2d ed. Grand Rapids, Mich.: William B. Eerdmans, 1999.